A personalized anniversary song is the perfect anniversary gift that allows you to express your love to your partner in a meaningful way. What’s more, it is a great relic for a lifetime of memories. It will be long remembered and appreciated. 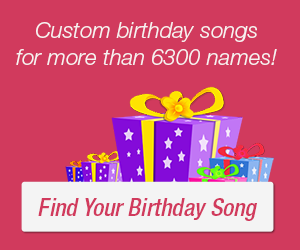 So don’t hesitate, order you song now. Share through Facebook, WhatsApp, email and etc. Get your MP3 and burn it on CD. Then you can play it in the most subliminal moment.